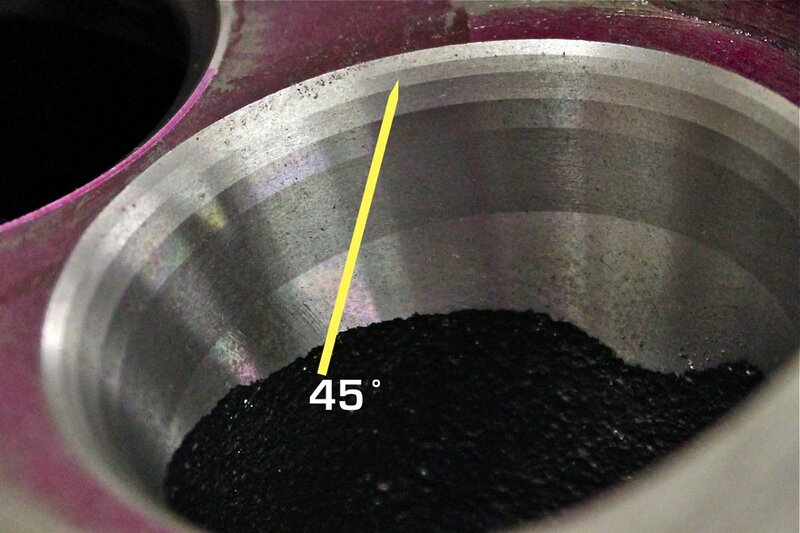 Racers have long known that valve-seat angles steeper than the traditional 45-degree cut will improve airflow characteristics into the cylinder and boost power. The natural response from street enthusiasts is to adapt this same strategy, so Internet forums and bench-racing debates often focus on whether a 50- or 52- or even 55-degree angle is best for their engine. After all, it’s just a minor change that’s hardly noticeable to the naked eye. It’s not the same as other racing tricks, like moving to a 13:1 compression ratio—which could lead to detonation—or running .800-inch valve lift—which could challenge the engine’s idle and low-speed drivability. What’s the deal with a few degrees of valve-seat angle, especially when everyone knows that it works? Need a valve job? Most street and many racing applications can go with a standard 3-angle valve job. Thanks to Borowski Race Enterprises for much of the photography that illustrates this story. 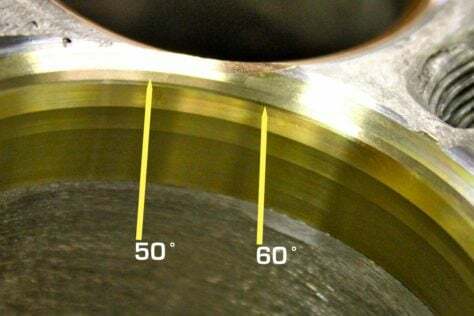 While some high-performance street-engine owners may claim success with a 50-degree or steeper valve angle, there’s probably a good chance they haven’t compared leak-down numbers recently or run the engine that hard. The cam profile and rocker choice play heavily into selecting a valve-seat angle. Higher lifts can take advantage of steeper angles while low-lifts are better off with a shallow angle. Durability issues aside, a steeper valve-seat angle may not be a wise choice for the street because the full potential often isn’t realized with a street cam. 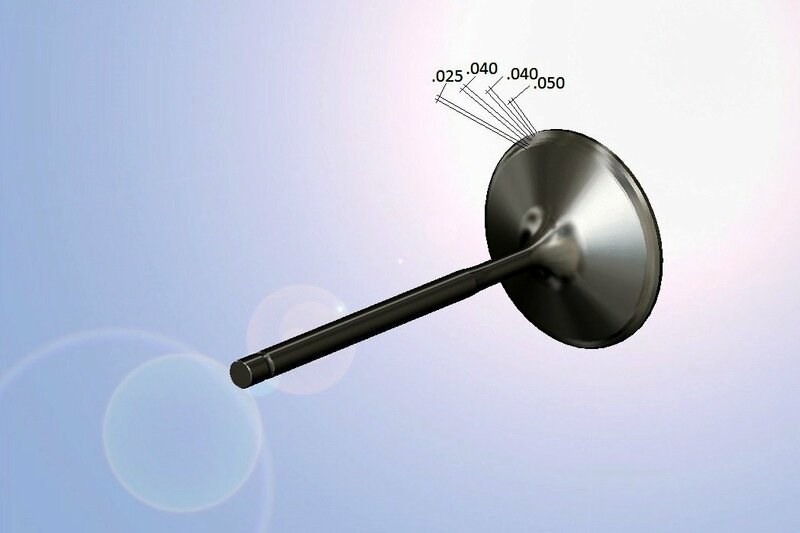 CFD and other computer simulation tools are helping shape modern valves. Yes, the valve job. One talking point often lost in the debate is that the valve-seat angle is just one contribution to complete the valve job. Remember, the air-fuel charge is directed not only past the valve but also through the valve-seat area below the bowl. And that’s where numerous angle choices come into play along with even more theories about how and where to grind metal. 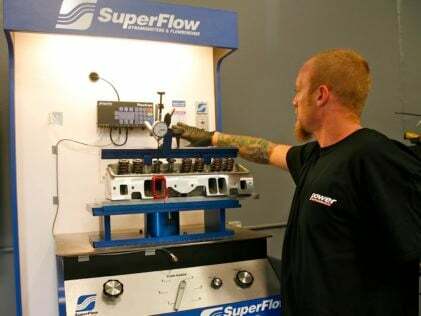 The SuperFlow SF-750 flowbench is very useful when determining the proper valve job for a particular application. The company's FlowCom computer and software package does all of the math, unlike past systems where the flow data was computed by hand. Testing the varying seat profiles can be a time-consuming job, but is worth the investment if achieving every last horsepower is your ultimate goal. It's also the only way short of putting the engine onto a dynamometer to quantify the valve job, and is a tool like any other in your engine-building arsenal. Greg Ertman of Borowski Racing Engines says flowbench numbers can be misleading when making changes to the valve job. “You may put a radius on the intake and it shows good flow, but you have to keep in mind reversion. You should flow the head in both directions; that is, flow the intake both like an intake and exhaust, then flow the exhaust both like an exhaust and intake. “Let’s say the intake flows 400 cfm at .800-inch lift, then reverse the air and flow it like an exhaust and it gets 320 cfm. Then you make a change and only get 390 cfm flowing like an intake. Most people would say, ‘Oh, that’s bad.’ But it also flows only 280 like an exhaust, and that’s good. There certainly isn’t a downside to 45-degree valve-seat angles. 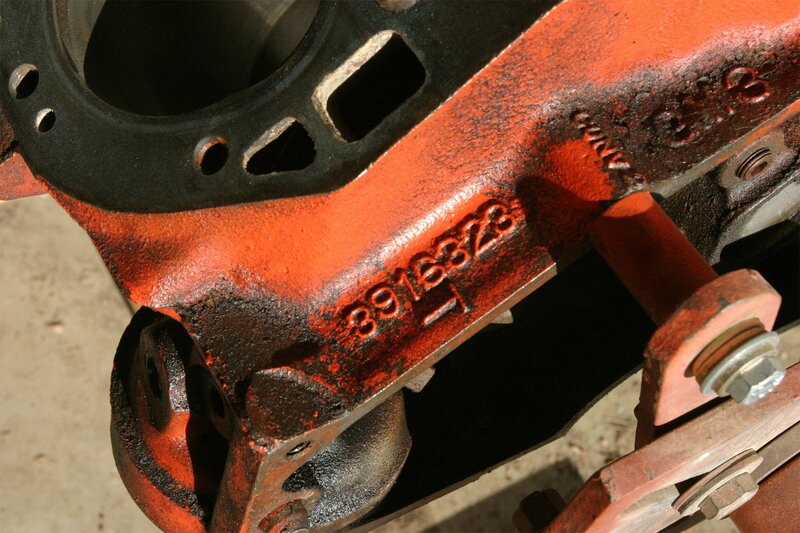 There are plenty of winners using a standard 60-45-30 valve job. And in a recent report by Race Engine Technology, there was an in-depth retrospect on the Cosworth CA Formula 1 V8 engine from 2006. 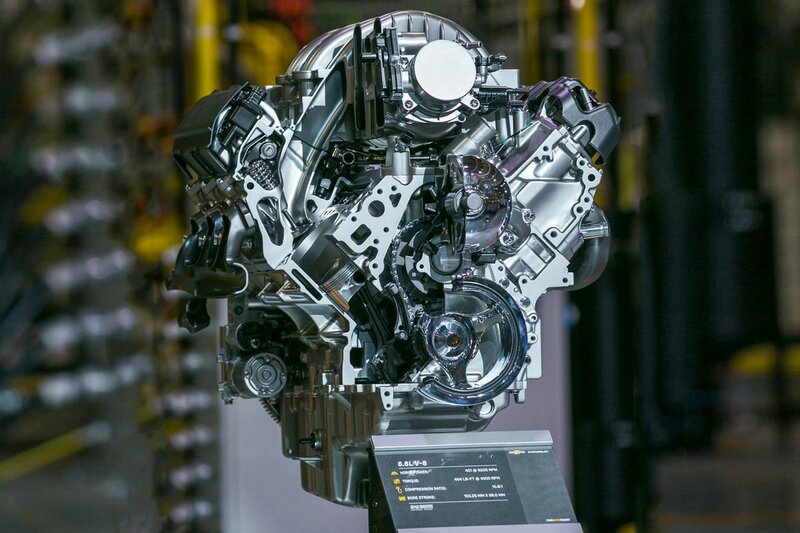 Revving to 20,000 rpm, this 2.4-liter engine featured 41.3mm (1.63-inch) solid titanium intake valves with a 1mm (.039-inch) wide 45-degree seat. On top, there were four progressive shallow angles before blending into the stem. 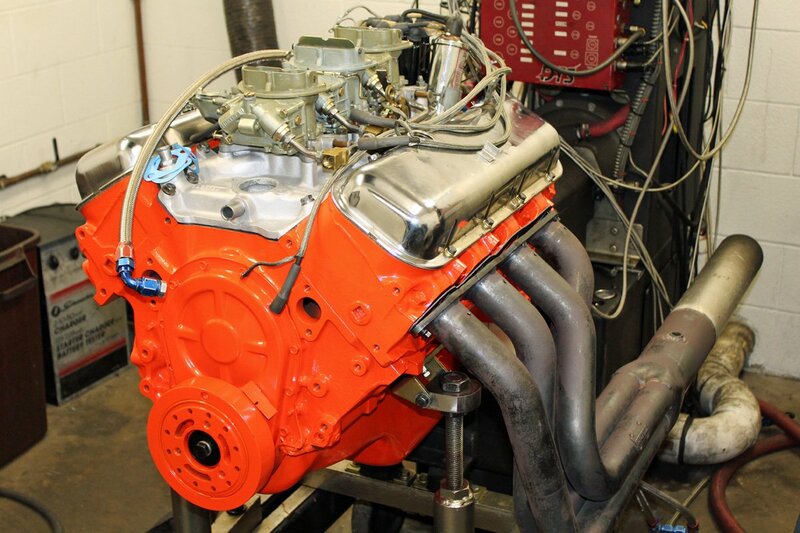 The intake also featured four different coatings to improve durability. On the exhaust side, there was 35.0mm (1.38-inch) sodium-cooled titanium valve with a 2mm wide 42-degree seat. So, the fastest-spinning V8 in racing used a 45-degree angle on the intake and even shallower on the exhaust. Just what is the valve job supposed to accomplish? 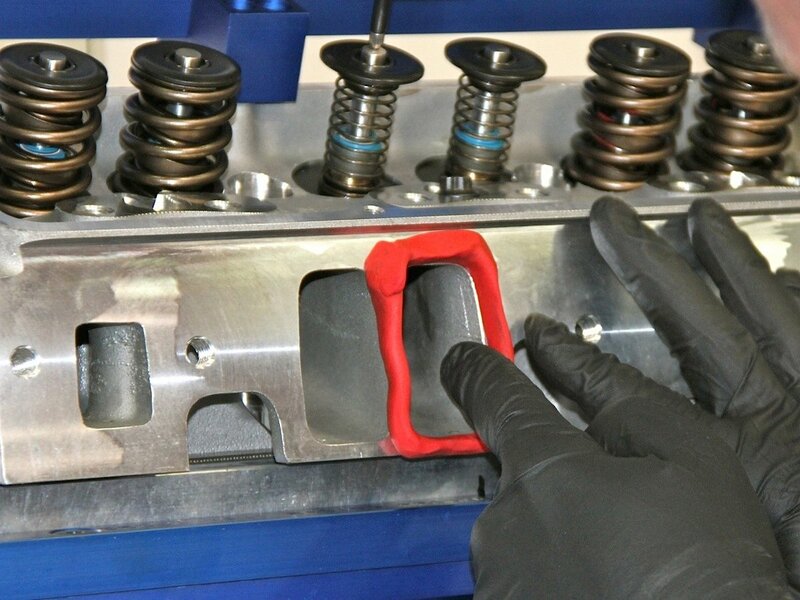 First, it has to provide a seal between the valve and seat to ensure there is no loss of pressure in the cylinder. The valves and seats must therefore be properly sized and concentric in addition to sharing complimentary seat widths and angles. 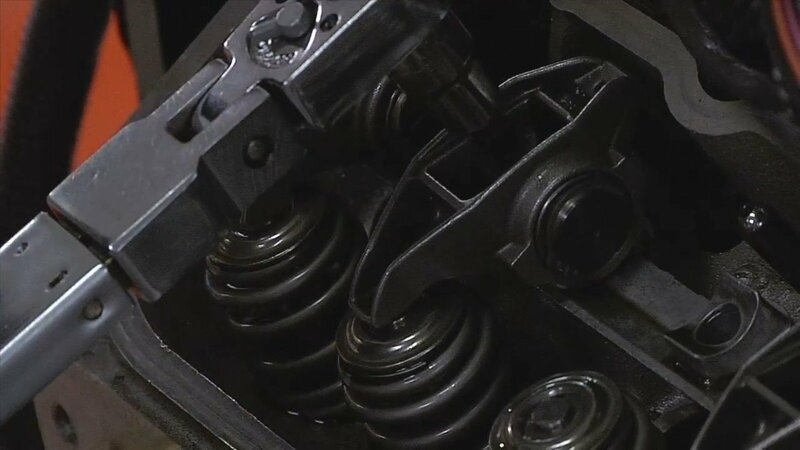 The sealing action has become a little easier with today’s higher spring rates, but any number of irregularities such as carbon deposits or a loose valve guide can affect sealing. Next, there has to be enough contact area on the seat to help transfer heat from the combustion chamber to the coolant passages. 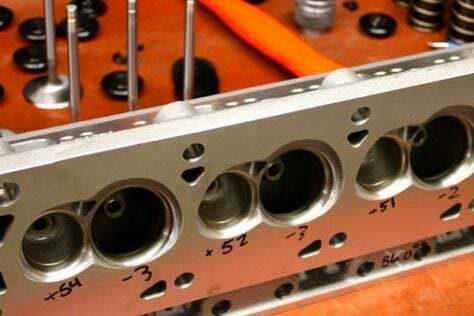 Consider the total surface area of a cylinder and combustion chamber, and the valves make up a significant portion, so its share of heat dissipation is critical to a performance engine. That’s why valve seats on the exhaust valve are usually wider than the exhaust. Very few valves outside the diesel market have 30-degree seats, but one notable exception is the Boss 429 valve, right. This Manley Boss valve measures 2.280-inch with a 30-degree seat measuring .100-inch wide. There’s also a .060-inch margin. Finally, the valve job must optimize airflow in and out of the cylinder. 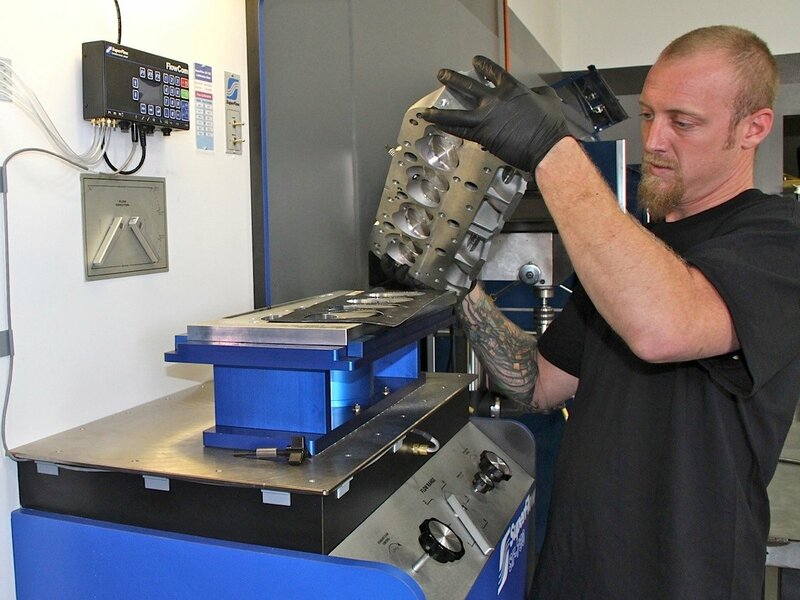 That’s where testing and CFD simulation programs have led to different seat angles, especially in very high valve-lift applications like Pro Stock. Which begs the question: If Pro Stock is running close to 1.2-inch valve lift, how can a few degrees of seat angle make a difference? “These guys are chasing every ounce of horsepower,” stresses Manley. “It’s only a few degrees but it thins out that area of the margin and makes it sharper and captures that intake flow much faster,” adds Urrutia. Valve suppliers require detailed information before delivering custom orders. If you think about how the valve openings are really the choking point in the overall airflow path chart, it’s easy to see how much impact the valve job can have on engine performance. Opening up the throat by just a few hundredths of an inch is much more effective than peeling one or two tenths off the intake port at the opening. 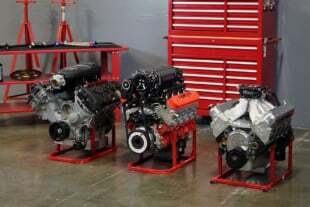 But the engine builder will always be limited by the valve size, which is limited by bore size and other factors. Here’s a cutaway of a Toyota NASCAR engine, although no secrets will be revealed. However, you can get a sense of the airflow down to the valve and how the valve job could enhance the dynamics if properly cut. A popular trend in many high-end engines is five angles on the cylinder head seat and three angles on the valve—four if you count the margin. Most experts agree that these additional angles on the head are necessary to optimize airflow into the cylinder; therefore, the intake side should never be blended around the seat. Here's a comparison of seats on two heads found in the Borowski shop. On the left is a 50-degree seat with four angles below and one on top. 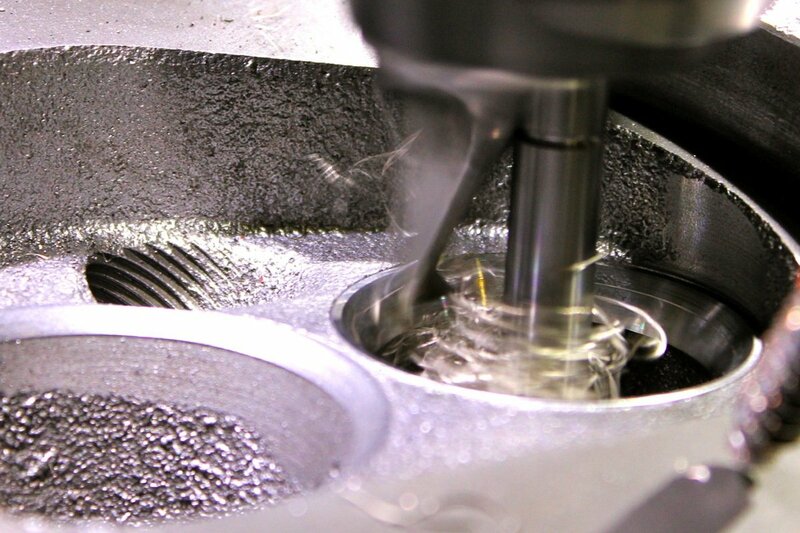 Cylinder head specialist Greg Ertman says the width and angle of the bottom cuts were a combination needed to achieve the desired final diameter before blending into the bowl. On the right is a vintage double-hump SBC with a 45-degree seat. Ertman was limited with the grinding for fear of hitting a water jacket. Here’s a set of Ferrea valves ready for install. 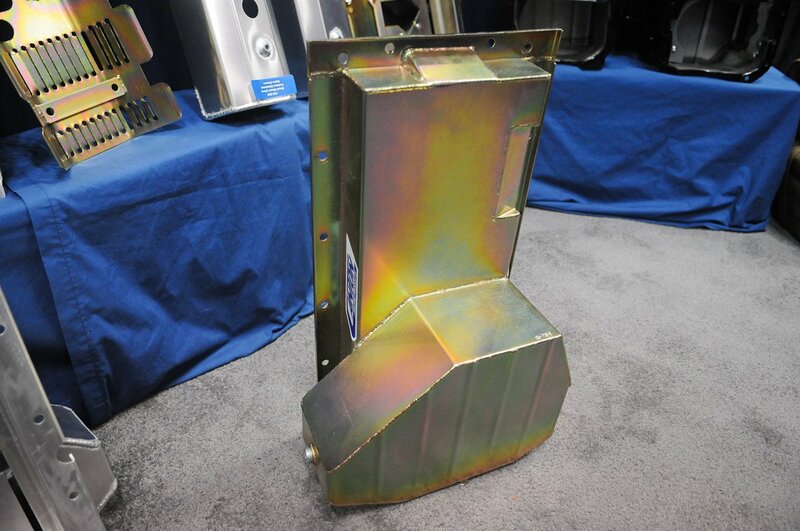 The 1.600-inch stainless-stell exhaust on the left is a simple single 55-degree seat angle with a thick margin. The 2.250-inch titanium intake has a three-angle profile, including the 55-degree seat. There are some applications where some intake blending may offer an advantage, such as NASCAR where engines are designed to run extremely hot (so the teams can tape up the grille to improve aerodynamics), and the heat helps keep the fuel atomized. 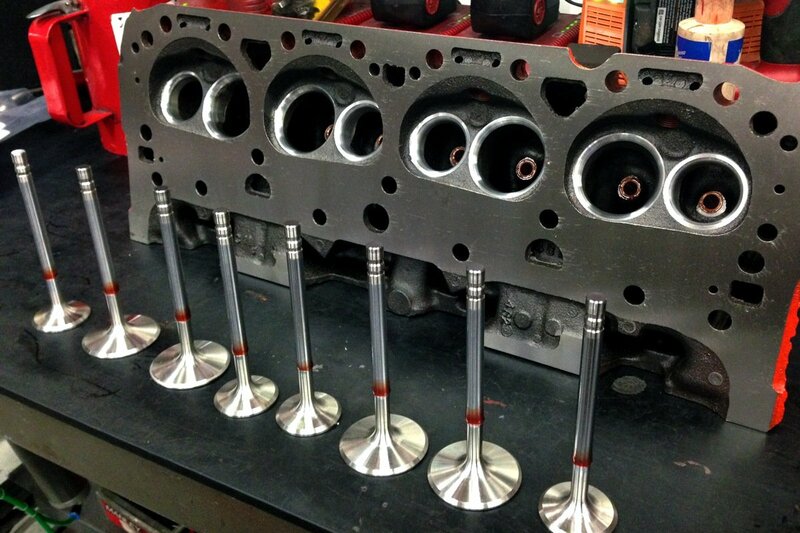 But for most race engines, a multi-angle valve job is quite effective. However, no formula exists for engine builder to shape the best possible valve job for a given application. Valve jobs are also key to ensuring that valve-stem protrusion is even across the cylinder head. The numbers on this head at Borowski Racing are Greg Ertman’s code for determining how much to sink the valve. There are some tips and suggestions that come as close to a general consensus regarding the degree of transition between angles flowing from the port to the seat. For the single angle on the chamber side or the top cut, there again is no consensus. 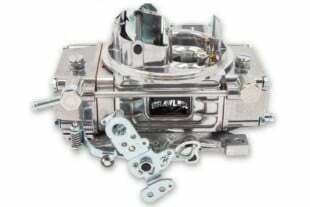 Precision machining is required to achieve quality multi-angle valve jobs. 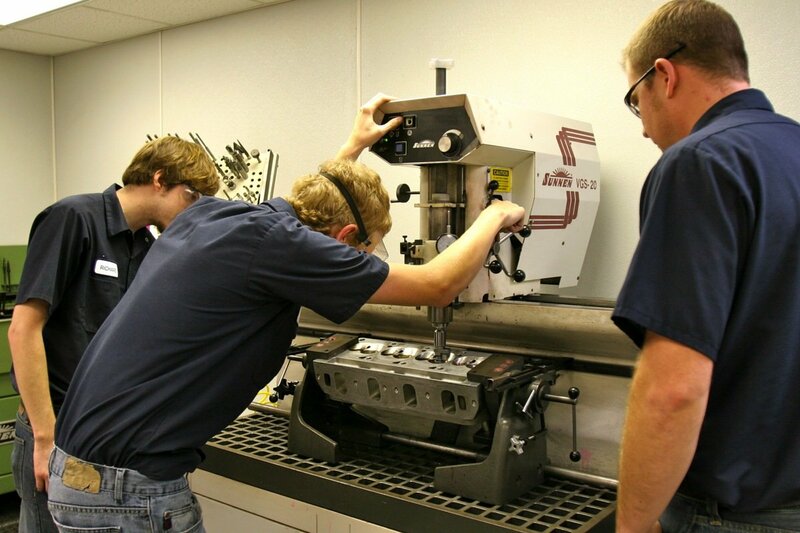 From left, students at the School Of Automotive Machinists work with a Sunnen valve guide and seat machine. A Newen CNC valve-seat machine at Borowski is shown in center and in action to the right. It can cut numerous angles at once to ensure exact dimensions and angles. “For the top angle I always want to eight to 10 degrees less than the seat angle,” says Ertman. There is some consensus on the width of the valve seat for the majority of applications. The intake side is generally around .040- to .050-inch wide with higher heat applications stretching to .060-inch. 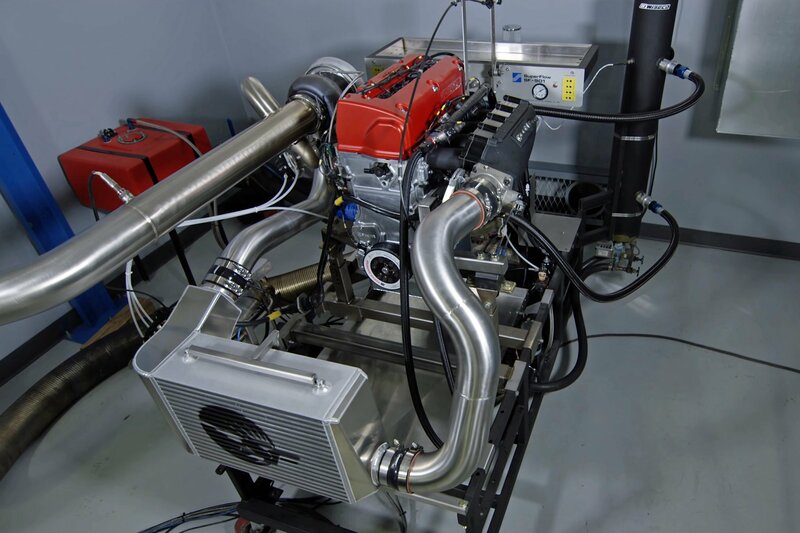 Of course, Pro Stock pushes the envelope all the time and runs in the .025- to .030-inch range. On the exhaust side the seat is upwards of .080- to .100-inch to transfer the heat to the seat material, which is another variable that must be considered. Here’s about as close to a current Pro Stock coated titanium valve as you’ll see outside the engine. It has a 55-degree seat and a thin .040-inch margin, but the angles cut for the multiple backcuts are not being released. 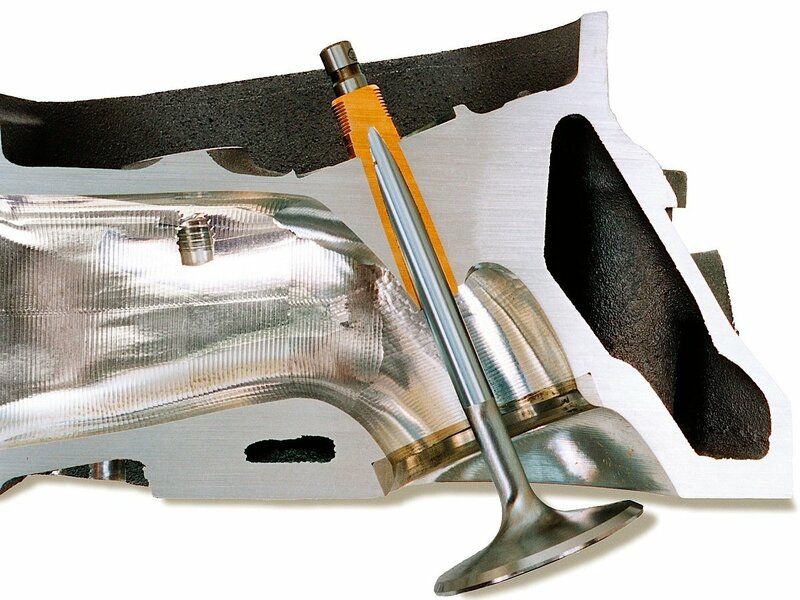 Here's the Pro Stock valve in comparison to a 55-degree titanium exhaust valve on the left, and another titanium valve with a 45-degree seat. The exhaust valve measures 1.600-inch and has a seat width of .090-inch to help transfer heat to the seat. It also has a 42-degree backcut and a .075-inch margin. Note the corner radius on the margin to help with flow and reduce chances of a hot spot. The 2.200-inch intake valve on the right has a .050-inch width for the 45-degree seat. There's also a 33-degree backcut that measures .080-inch and a .080-inch margin. When using titanium valves with steep angles, some type of copper alloy valve seat is preferred. 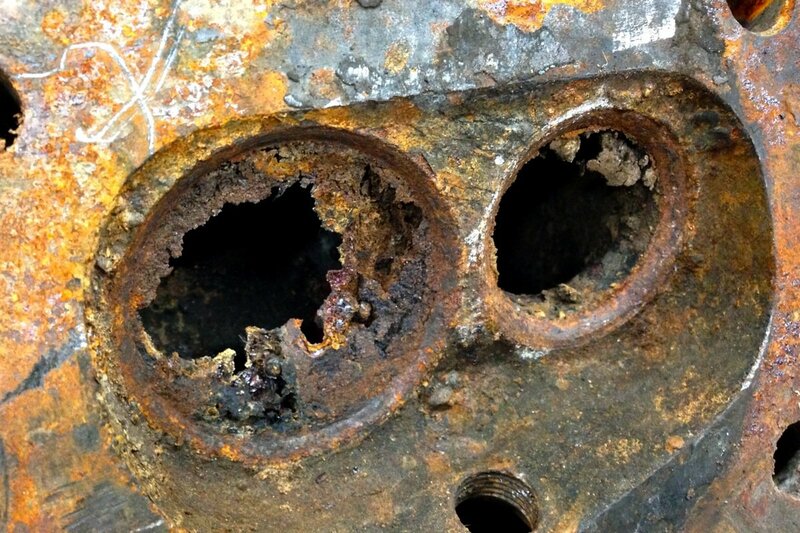 Beryllium copper is popular, but some engine builders avoid it on the exhaust side due to beryllium’s carcinogenic warnings. Other materials such as nickel and silicone are being added to copper to provide the necessary properties for heat transfer and durability. 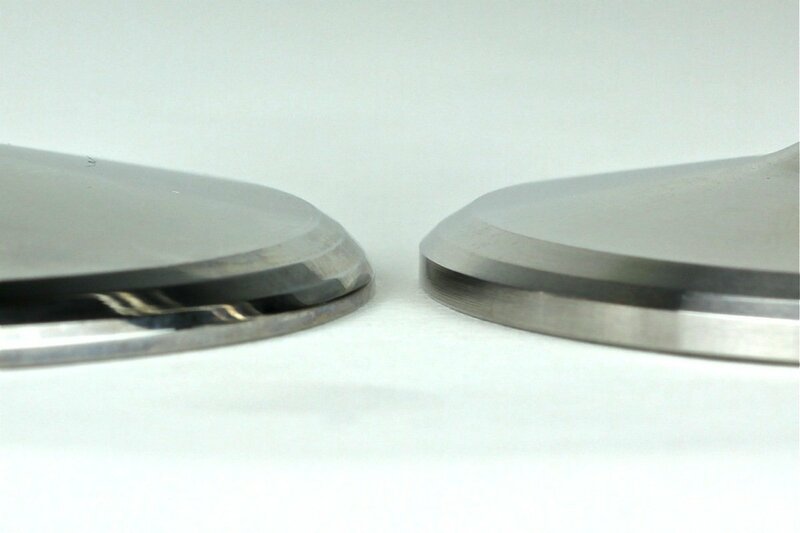 The valves must also be treated to a diamond-like coating (DLC) or chromium nitride coating (CrN) to reduce the chances of metal transfer or micro welding. Here’s a racing head at Borowski that’s getting alloy seats inserted. The back angles on the valve and the radius that blends into the stem are additional variables that contribute to airflow performance. Again, there are numerous theories as to the number of back angles and their transitions as well as the choice between tulip- or nailhead-style valve designs. How steep can you go? 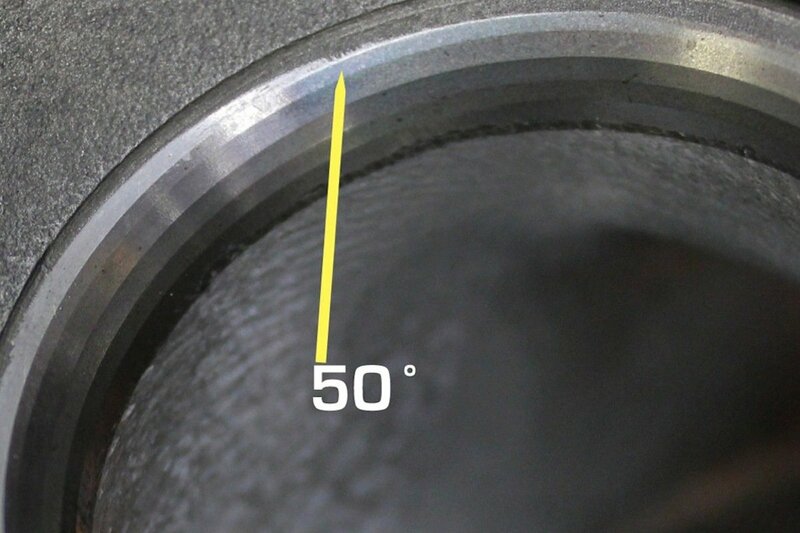 On the chamber side, engine builders also work with different thickness of valve margins as well as options to angle-cut or radius the margin. One consensus on valve design is that the exhaust margin needs to be thicker than the intake. 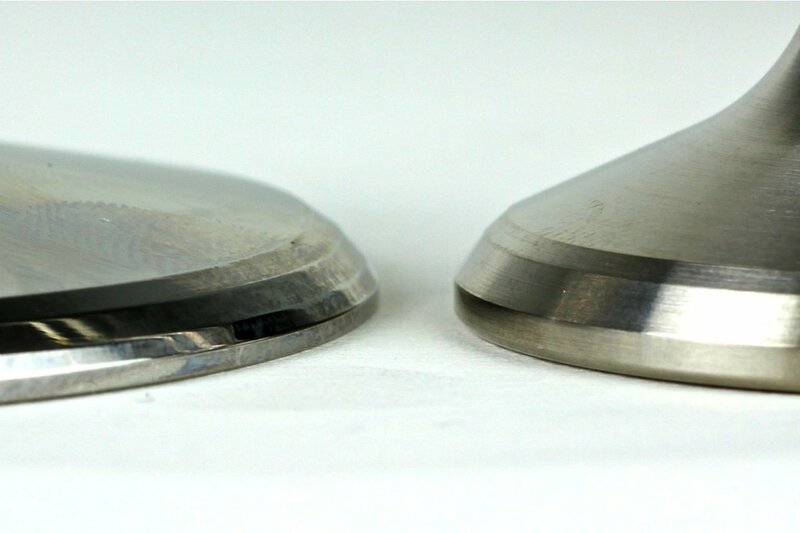 Here are two titanium intake valves that look nearly identical but there are subtle differences that would be beneficial to specific applications. On the right is a 52-degree, .050-inch-wide seat with a 35-degree backcut and a .080-inch margin. On the right is a 50-degree, .050-inch-wide seat with a 35-degree backcut and a .070-inch margin. Both the backcuts are .080-inch wide. 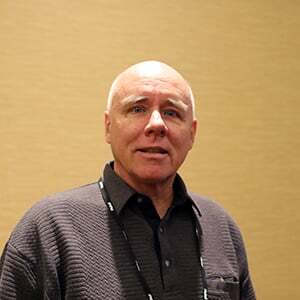 “You have to be very careful not only with the margin thickness but the relationship of the back angle to the dish angle, if you choose to dish the valve,” warns Manley. 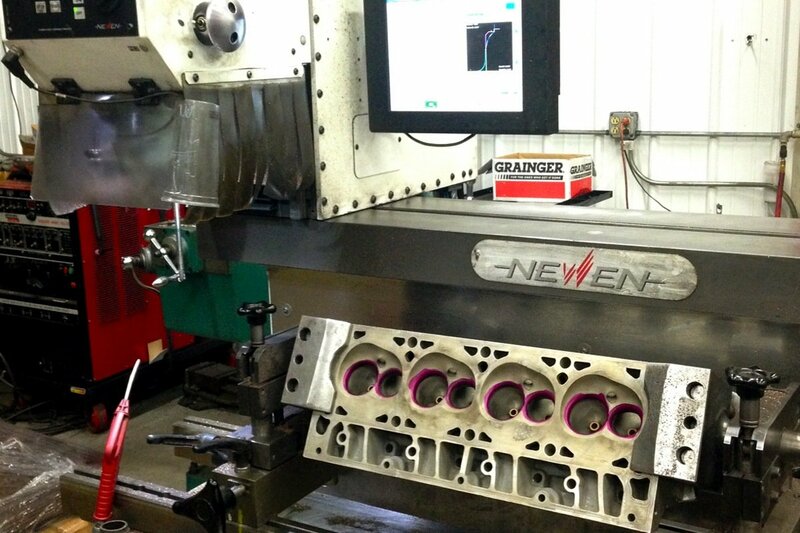 This cylinder head will go on a blown alcohol engine. The copper beryllium seat is machined with a 50-degree seat and 40-degree top angle. Just below the seat is a very narrow 60-degree cut that Ertman says helps a 50-degree flow like a 55-degree. The next three angles are wider than usual to help minimize the large fuel droplets associated with alcohol. Clearly, synergy between the valve seat area and the head of the valve is crucial to optimum airflow and engine performance. 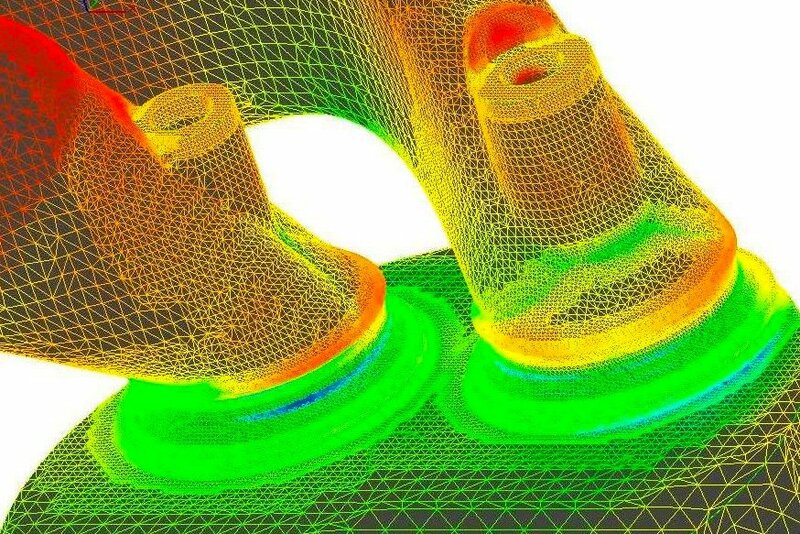 Most of the development and improvements come from trial and error and flowbench tests with computational fluid dynamics (CFD) simulation offering additional insight into all the angles that must be considered. But just how steep can racers go to pick up a couple horsepower before there’s a point of diminishing return?